The training outcomes provided by Phaphama Initiatives are unparalleled in terms of effectiveness. Evaluations inform us that the training outcomes provided by Phaphama Initiatives are unparalleled in terms of effectiveness. Workplaces are often tough, competitive and stressful, and in need of the development of policies and skills to enable the people who work in them to be committed, motivated and productive. 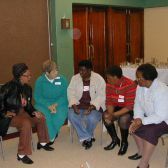 Because individuals in working communities come from different backgrounds, each with their own experiences, perceptions, differing styles of communicating and dealing with issues, they often find themselves in conflict situations that they don't understand. Our work focuses on building healthy human relationships that positively transform workplaces and the conflicts found in them. 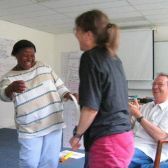 Our extraordinary training methodologies are experiential, fun and unlike anything most participants have ever encountered - because to they get to the hearts of both the participants and the matter. 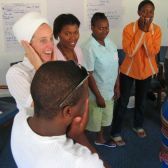 Founded on the real-life experiences of participants, the facilitators guide the process toward inclusive outcomes in ways that demonstrate how commitment and enthusiasm are nurtured. Built into the fabric of all assignments is excellent teamwork, demonstrated by facilitators working in seamless teams carefully chosen to provide a balance of diversity. Phaphama Initiatives participates in an international network of organisations doing similar work in more that 30 countries with a view to sharing experiences and learning from one another. We will be happy to facilitate tailor-made workshops on issues as required by you.